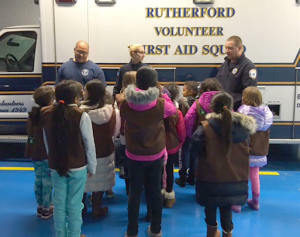 On December 2nd, girl scouts troop number 6032 visited the Rutherford Volunteer Ambulance Corps to learn about recognizing an emergency, who to call, and what they can do to help, in order to earn a new badge. The girls were split up into three groups where they rotated to different stations ran by an EMT to learn about various aspects of what BLS does and were taught how to help prior to their arrival. In the first group Jerry showed the girls what the jump kit from the ambulance contains and what each piece of equipment is used for. This included things such as EpiPens, oral glucose, sheers, Oxygen, face masks, and bandages, amongst others. After learning about our equipment and what we take to each call, the girls rotated to the next group where Cara showed the girls simple bandaging using a cravat. The girls learned how to bandage a simple laceration on an extremity, how to wrap a head wound, and how to make a sling for an injured arm or shoulder. In the last group, Jason gave a brief explanation on when CPR is appropriate and how to perform it correctly. Afterwards the groups came together and all three EMTs joined together to teach the girl scouts what to do in a choking emergency and how to perform the Heimlich Maneuver. At this time the floor was open to questions from the girl scouts and they were given an opportunity to share experiences they have had where an emergency was present, what they did, and how they could have used what they learned during their visit. After inquiries and story-telling, the girl scouts were brought into the ambulance and shown what equipment is in each compartment and told what it is used for. They were also shown the outside compartments and saw the ambulance with all of its emergency lights on. The night was an overall success and the EMTs were able to offer knowledge to the young residents about emergencies and what they can do to help. It was a learning experience for both groups fun for everyone involved.